UFC Refresh Coconut Water with Watermelon is good combination between the selection of juicy watermelon and 100% coconut water. The drink contains fiber which encourages a healthy digestive treat and high in manganese. 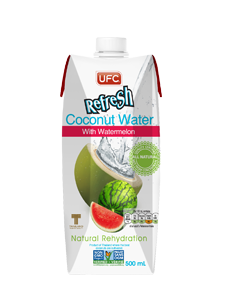 UFC Refresh Coconut Water with Watermelon creates a more botanical, fresher, and less sweet flavors delivering a more complex and exotic product to excite consumer taste.